Get important notes on CBSE Class 12 Chemistry: Alcohols, Phenols and Ethers (Part - I). These notes will give you a quick glance of the chapter and are important for revision purpose. Get revision notes on CBSE Class 12 Chemistry: Chapter 11 - Alcohols, Phenols and Ethers. These notes are based on the latest CBSE syllabus and very helpful for revision purpose. An alcohol is any organic compound in which the hydroxyl functional group (–OH) is bound to a saturated carbon atom. For example: methyl alcohol, CH3OH; ethyl alcohol C2H5OH, etc. This type of alcohol has only one carbon atom attached to the α-carbon atom. Here α-carbon has two other carbon atoms attached to it. In such alcohol three other carbon atoms are attached to the α-carbon atom. They contain only one OH group. They have a general formula CnH2n+2O. For example: CH3OH, CH3CH2OH, CH3CH2CH2OH, etc. 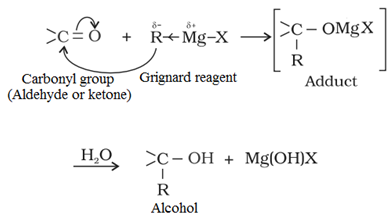 Such alcohol contains two OH groups. This type of alcohol contains three OH groups. these are the alcohols that contain more than three OH groups. (iii) Then identify the hydrocarbon group and name it as per the IUPAC naming system. (iv) Now replace the ‘e’ in the end of the parent hydrocarbon name by ‘ol’. o The common name of alcohol is alkyl alcohol. o Depending upon the upon the structure of the alkyl group, prefix n, iso, sec, tert or neo is added to the common name. ‘n’ is added when α-carbon and other carbon atoms make a straight chain. ‘sec’ is added when the α-carbon is attached to two other carbon atoms. ‘tert’is added when the α-carbon is attached to three other carbon atoms. ‘Neo’ is used when quaternary carbon is present. (i) By acid catalysed hydration of alkenes in accordance with Markownikoffs rule. (ii) By hydroboration-oxidation of alkenes in accordance with anti-Markownikoffs rule. (i) By catalytic hydrogenation of aldehydes and ketones. 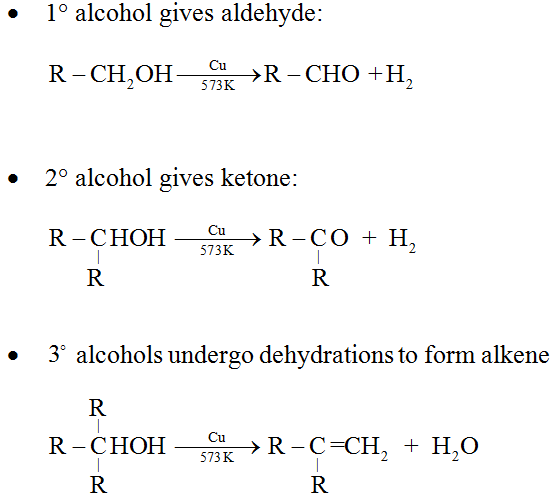 Note : Aldehydes yield primary alcohols whereas ketones give secondary alcohols. 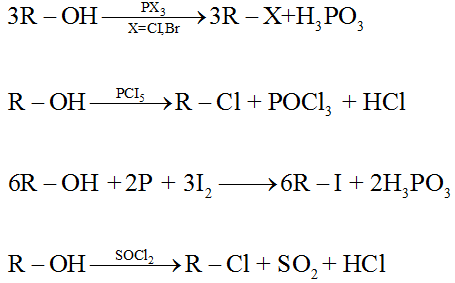 (ii) By catalytic reduction of carboxylic acids and esters. It gives R group as a nucleophile to attack at the partrially positive carbon atom of carbonyl (–C=O) group. • Lower alcohols are liquid at room temperature while higher ones are solid. • The boiling point of alcohols is higher than haloalkanes with the same number of carbon atoms. This is due to the fact that alcohols are associated via intermolecular hydrogen bonding. For the same alcohol, as the branching increases, boiling point decreases due to decrease in surface area. • Lower alcohols are completely miscible in water due to their ability to form hydrogen bonds with water. Solubility in water decreases with increase in molecular mass due to a decrease in the extent of intermolecular hydrogen bonding. • Alcohols are weaker acids than water due to the lower polarity of O – H bond in alcohols. The acidic strength of alcohols decreases as the number of electron donating groups increase at carbon. Depending upon the structure of the alcohol and the type of oxidising agent used, oxidation of alcohol gives different products. Dehydration of alcohols takes place in acidic medium. Intra-molecular dehydration leads to the formation of alkene while inter molecular dehydration forms ether. 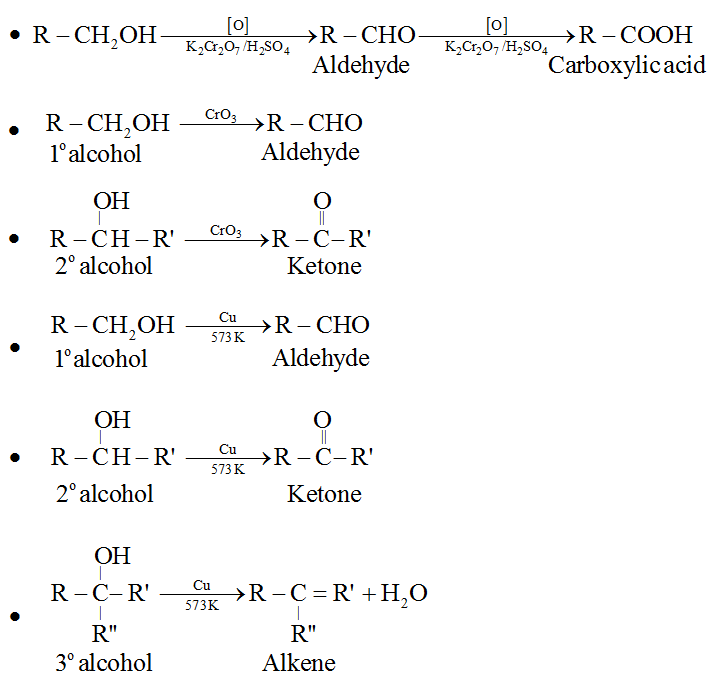 Dehydration of alcohols with conc. H2SO4 at different temperatures yields different products. Lucas reagent which s a mixture of conc. HCI and anhyd. ZnCl2 is used to distinguish and alcohols. • 3o alcohol gives cloudiness or turbidity with Lucas reagent immediately. • 2o alcohol gives cloudiness or turbidity after 5 – 10 min. • 1o alcohol does not give cloudiness or turbidity at room temperature. Two commercially important alcohols are methanol and ethanol. Methanol is mainly produced by catalytic hydrogenation of carbon monoxide at high pressure and temperature and in the presence of ZnO – Cr2O3 catalyst. • It is a colourless liquid and highly poisonous. • It is completely soluble in water. • It is used as a solvent for paints, varnishes, and for making formaldehyde. Ethanol is mainly obtained commercially by fermentation of sugars. The sugar sugarcane or fruits such as grapes is converted to glucose and fructose, in the presence of an enzyme, invertase. Glucose and fructose on fermentation in the presence of another enzyme, zymase, yield ethanol. • Ethanol is a colourless liquid. • The boiling point of ethanol is higher than methanol. • It is used as s solvent in paint industry. • It is also used in the preparation of a number of carbon compounds. The commercial alcohol is made unfit for drinking by mixing in it some copper sulphate and pyridine. This is known as denaturation of alcohol.